3000-4000BPH Four Cavity Automatic Pet Blow Molding Machine through a certain process blow the preform into plastic bottles.Mainly to produce the carbonated bottle, mineral water bottle, pesticide bottle oil bottle cosmetics, wide-mouth bottle and hot fill bottle and so on. All spare parts of four cavity automatic blow moulding machines are treated by high and new technologies, precise machining and careful assembly to attain technical requirements of all aspects. Moving parts are connected with boundary lubricating bearings and straight guide rails( guiding blocks are made in Japan). Japanese made bumper is adopted for preventing mechanical bumping, which ensures low mechanical noise, low failure rate and long service life. Moreover, unique design of air blowing mechanism ensures very high output rate of finished products. 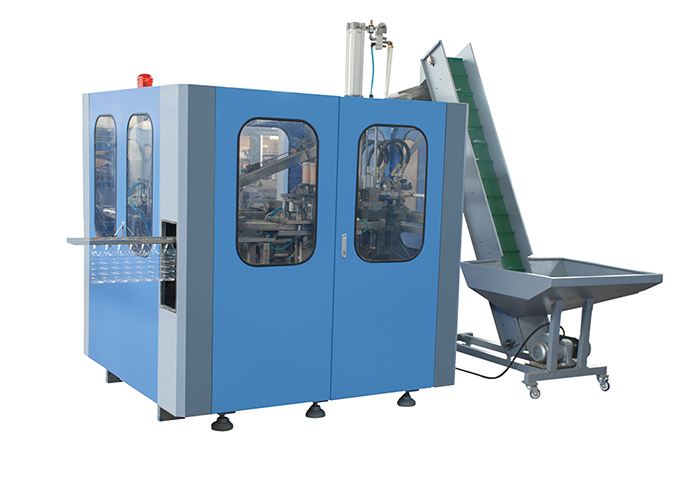 The operation of this type blow molding machines are computer controlled, which ensures accurate and reliable operation. Individualized operations and operation monitoring of the machine are realized by human-machine interface.